Our survey does not force patients to fit their answers into predetermined categories. They can be heard in their own voice. They may complain about areas that are not listed in longer surveys (e.g. parking). To make sure that the report reflects all comments, we create Word Clouds. In these displays, the size of words or keywords used often is changed to reflect their frequency. 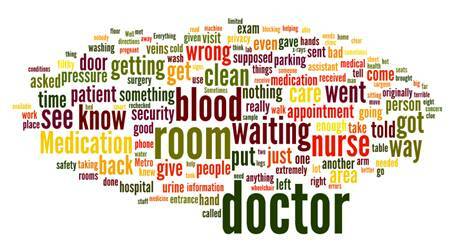 Here is an example of words used by patients to complain about a mid-west hospital in United States. If significant change in patterns of satisfaction has occurred, the computer alerts the clinic manager. Statistical process control tools are used to test whether there has been a statistically significant change. If there has, then an email is sent to alert managers to the change. Our automated reports also display changes in pattern of comments over time. The following Figure shows an example of how data are displayed over time. This is done through display of control charts. Control limits can be suppressed, set based on historical patterns, set based on other units within the same organization or set based on performance of peer organizations. In this Figure, no control limits have been displayed. We see a change in rate of complaints within specialty care.